Vegan Banana Oatmeal Pancakes was posted on June 22nd, 2011 and is filed under Breakfast, Dairy Free, Kid Friendly, Recipes, Vegan. This entry has 209 comments. You can follow any responses through the RSS 2.0 Comment Feed. I love pancakes to the moon and back. They’re just so flipping good (yes, that was almost a pun)! Here’s one of my favourite pancake recipes. Because of the bananas in the batter you don’t need any sweetener, so it’s sugarless! It also happens to be vegan…and it is really low in calories, but don’t worry, what is sacrificed in calories is not traded off for flavour! In my mind, this equals the perfect pancake. Blend all the ingredients in a blender, except the bananas. Now add the bananas and continue to blend (in blender) until the bananas are smooth. Pour onto a hot griddle (lightly oiled with olive oil or coconut oil) and cook. Once the pancake bubbles on one side, it’s time to flip it to the other. This makes a dozen, medium-sized pancakes, serving 4 people. 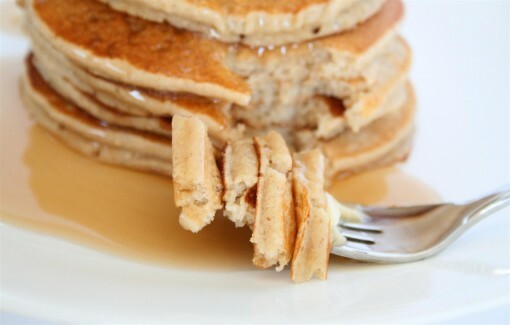 I love these pancakes with a little bit of peanut butter with real maple syrup…these pancakes are very fluffy and it tastes like a giant marshmallow AND it’s healthy! Soooo good. Okay, I need to stop drooling on the keyboard. You know what’s weird though? I do not like waffles…in fact, they are one food I really, really don’t like. Isn’t that strange? It’s not really the taste, it’s the texture of all those little squares…I don’t know…maybe I’ve just never had the perfect waffle. So what is it…pancakes or waffles? What are you favourite toppings for pancakes? Yum!! I am having pancakes for breaky today too!! These vegan pancakes look so nice and fluffy – and I love that there’s no added sugar! Beautiful pancakes! I’ve never made vegan pancakes but hey seem easy enough. I will give them a try. I love pancakes! I like waffles but they require more clean-up than the griddle cakes :) GREAT photos, these look delish!!! Chocolate is my first fav as well, i adore pancakes on sunday and your looks just right on spot wonderful! thanks for stopping by my blog and for ur words or appreciation!! Turns out I eat a banana and oatmeal every day for breakfast. In fact, I just finished the banana and am staring at the bowl of oatmeal. Looks like I get to try something new tomorrow. These were great! I made them for a bunch of people for breakfast and many people asked for the recipe. I added toasted walnuts & chocolate chips to the pancakes when they were on the griddle. I even made them a second time the next day but added an extra tsp. of baking powder which I think helped them be a bit fluffier. I love how healthy these are! thanks! These are so good! We have pancakes every Sunday night and I like to try different recipes. My boys all gobbled these up and I loved the intense banana flavor! I made this recipe today! Delish! Thanks for sharing this wonderful recipe! Wow! These were delicious. I substituted sea salt with regular salt since I didn’t have any. & I only had “quick” oats so I used those as well. They turned out great! I halved the recipe as it was only for me and had half for dinner last night and the rest of the batter this morning for breakfast. I used syrup last night and they were really good. This morning however I went crazy and put chocolate chips in them and topped them with peanut butter. WINNER! I loved loved loved these! This is going to be my go to pancake recipe! It’s good for you too — kinda unreal. Thank you so much! I am bookmarking this and making them TONIGHT! Wow! my daughter and I are vegan and have pancakes every sunday for breakfast and I have tried EVERY recipe out there and none of them are just right, but these were AWESOME! I added a little bit more(3/4c) whole wheat flour b/c they were pretty runny and thin first go round but otherwise these are our new favorite pancakes! can’t wait to make them for my family visiting over the holidays! These were my favorite pancakes I have ever made! Topped with some strawberry jam and syrup… YUM! I love these pancakes …. I have a similar recipe …. to which I add 2 tablespoons of Canola Oil . I just made these. I love them! Very tasty. I made blackberry sauce for them, but I like them so much plain that the sauce might have to wait. These pancakes saved my christmas! I was put on an elimination diet a month ago excluding dairy, soy, eggs, nuts and so on due to suspected food intollerances in my now 8 week old daughter. These are so yummy and quick to make (i just swapped the soy for oat milk). I just made these tonight and subbed buckwheat flour for the whole wheat to make them gluten free. They were delish…and so easy! These pancakes were great! Best texture vegan pancakes I’ve made. Thanks for sharing the recipe. Would I be able to use regular salt if I don’t have sea salt. I love to make pancakes, I am excited to make these one morning! They look absolutely delicious. I tried the recipe but the pancakes don’t cook enough, even if a cooked them in low temperature for a long time they turn out raw on the inside :( I’m so disappointed… what do you think i’m doing wrong???? Maggie~ I cook mine at about medium heat. I’d say cook them on a higher heat, thin the batter with more liquid, and make smaller, thinner pancakes. Hope that helps! Thank you! I’m gonna try that :) Hope it works! Can I use almond meal instead of the whole wheat flour? Or what about rice flour? Wow, these were the bombdiggidy. Such great flavor and texture. My new favorite pancake recipe, seriously. Thanks so much for sharing!!!! I put a cup of oatmeal in the food processor while I made the bed and came back to oat flour! I didnt use any whole wheat flour. I did use unsweetened coconut milk and very happy now! Can I use skim milk instead of soy or almond milk? I know they won’t be vegan – but will the recipe still work? Gwen – For sure! Skim milk will work fine! I use steel cut oats, as they are less processed. Would I need to adjust the measurements to replace the old fashioned oats? I made these for brunch today… we loved them! I added some vanilla and cinnamon. Thank you for the recipe! I am going to make these tomorrow morning for the kids. Will have to use organic milk instead though as it’s all I have on hand. Going to top with PB, raisins and sliced banana! Reagan~ Hmmmm, I’ve never tried that. If I were to use steel cut oats, I’d cook them first. However, I think they wouldn’t be as light and fluffy. I’m sure the measurements would have to be adjusted, but since I haven’t tried it – I’m just not sure. If you try it, let me know how it goes! Longer…way longer then normal Pancakes. 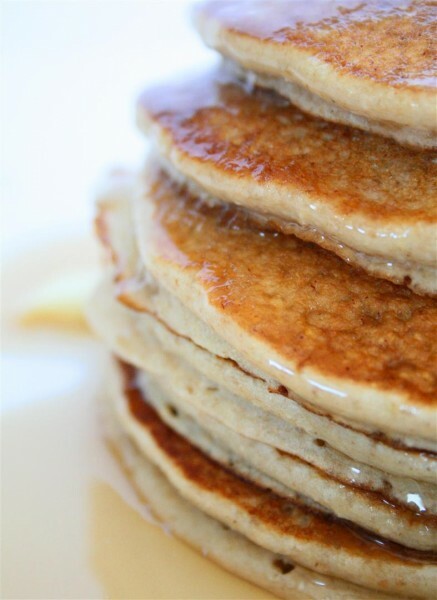 Question for you: One of my past favorite pancake recipes used cow’s milk with white vinegar added to “sour” the milk, for more of a buttermilk flavor, and it was so good. Any idea if that trick would work with almond milk or soy milk? This is honestly the best pancake recipe EVER!!!!! I love these! these are not that greasy as the normal onces! What did I do wrong? These came out horrible. They were chewy and dense, not light and fluffy.. And I followed the recipe exactly. Kerry~ If you followed the recipe exactly, you may have over-mixed the batter. For pancakes and muffins I always use a very light-handed touch when I’m stirring (and just until mixed). Too much stirring toughens the batter. Try folding the batter lightly. I know this isn’t a waffle recipe, but Ive been searching high and low for one that is lower in fat and carbs yet vegan. Any idea if this recipe would be suitable for waffles, even if it was altered a bit? I tried these this morning to use up the last 2 ripe bananas. Sprinkled my serving with chocolate chips & topped with a bit of almond butter. They were delicious! My husband even enjoyed his (with just spread & syrup) and he doesn’t like anything “new” the first time out ;-) I’m normally a “1 big pancake vs. 2 or 3 smaller pancakes” girl. I couldn’t get this recipe to cook up well in larger cakes, but smaller ones (as you recommend) turned out perfectly. Thanks for a good, solid recipe! Dawn~ Yay! So glad you like it! Just made these this morning for a crew of hungry boys and everyone looooved them! Seriously – thank you! I too cooked them for longer than usual to get the middle cooked-through. They came out a little dense…anything to make them fluffier? Suzanne ~ With any pancake batter it’s important to stir with a light hand, because sometimes if you stir too much the batter will be a little tough. Another tip, if you’re not vegan, is to add an egg. These tasted very good, but when I was mixing in the blender, it seemed too watery… is that the same with everyone else? I’m not vegan, so I used 0% milk, would that have made a huge difference? I really like the fact these did not have added sugar, which is good for our low carb diet. Paco ~ 0% milk might be a bit watery. If you’re not vegan, why not use 2% milk? If it’s still watery, you may be using too much liquid, so just reduce it a little bit. So glad you like them! Raquel ~ It’s funny because almost everyone loves these pancakes, yet once in a while, someone says it doesn’t turn out. I have found that since I’ve switched to using a non-stick pan everything comes out well – where as, using a normal pan would make even fool proof recipes not cook properly. If the batter is too thin, add more oatmeal or flour. Make sure your bananas are ripe (so they’re sweet and have lots of flavour!). Your pan needs to be hot enough to cook the middle through as well. Hope these tips help! These turned out perfectly and were so delicious!! Every time I make pancakes I make a new recipe because I’ve only found one other recipe I love enough to make more then once. These pancakes are perfect. They brown wonderfully, the texture is different from pancakes, they were moist but it was great. They can certainly be eaten plain but I used pure maple. They also have a buttery taste to them. My 1st 2 were thin and hard to flip but after the batter sat for a few minutes the next ones turned out fluffier. My variation was adding 1/2tsp cinnamon, 1/4tsp vanilla extract, for the milk I used half almond and half rice both vanilla flavored. I had some trouble flipping so I just used a butter knife to lift them up enough so I could get my spatula underneath without squishing them together. I used canola oil spray so they wouldn’t stick. Also I ground the oatmeal separately added everything into a bowl except the banana and milk, pureed those 2 together then added it to the dry ingredients. I have a single serve blender so it was easier that way. Having hard time not finishing the rest off. Lisa~ I blend the mix on the lowest setting on the blender till it’s smooth…or you can do it by hand…the main thing is to get the bananas smooth, so you could blend those up separately and add it to the rest of your ingredients after it’s pureed. If you find they are still a bit dense, what I do is thin out the batter with more “milk” to make thinner, less dense pancakes. Hope that helps! Just made these pancakes! They turned out really yummy and awesome! New favorite recipe!! I used gluten free flour and for the first time in several years I had not only a first helping, but a second helping of these delish pancakes!!!! Oh my! Made this tonite, my kids really really enjoyed them, we don’t consume any dairy and eggs at home and this recipe worked perfectly for me. Keeper for sure! Thank you so much for sharing this fantastic healthy recipe! These were delicious! They were a big hit with the whole family. Used almond milk and added and splash of vanilla. Served with fresh strawberries and a little 100% maple syrup. They’ll be a staple out our house for sure. Thank you so much for sharing. Thank you for this amazing recipe! The pancakes were delicious! Thank you! My tummy is so happy :) I used Silk Coconut milk because I thought the flavor combo would be great (it was) but my pancakes tended to burn quickly and I have a feeling it was the coconut milk so next time I open a carton of almond milk and try these again on a bit lower temp. Still really good. roscos chicken an waffles has theeee best!!! wafflesss its amaaaazing! I tried these last night and they were an epic fail for us, lol! They didn’t get fluffy like the picture and were raw in the middle (I let them cook on medium and then low for well over 20 minutes and they were still raw and gooey on the inside. I’m sure it was some sort of error on my part, lol! Becki- Sometimes I thin out the batter and make the pancakes smaller if I feel they’re not cooking well. This usually does the trick! Very nice and Caribbean, will definitely make again. I love the burst of banana flavour, maybe add a little rum for flavour next time. They don’t sit heavy in my stomach like regular pancakes made with eggs, flour, oil & sugar; plus the leftovers make a nice snack. Just made these! Used 2% milk cuz that’s all I had… and I added a bit of vanilla, but otherwise, the same! Excellent. Pancakes for breakfast? That’s the right way to start a perfect day. Looks delicious! Thanks for the recipe. I made these tonight. The kids gobbled them up. Even the ones without the allergies :) I read through the comments, do you or anyone else have any suggestions with trying these with almond flower to make them wheat free? Renee~ So glad they liked them….I haven’t tried them with almond flour, but I’d love to hear how it goes! I am so excited to make these!! I cook for my elderly neighbor all the time! I just stumbled upon this recipe on Pinterest. My question is, is it 64 calories a pancake? Or per serving? Thanks! Ps love the pictures!! Katherine- It’s 64 cals per pancake! Allergic to bananas and cant hv applesauce. I don’t know what else would work. Any banana substitutes that you think wd work? Coulc you freeze a batch of these for busy mornings? Beverly – I would freeze it in single servings. It’s so funny what you said about not like waffles but loving pancakes. My husband is the EXACT opposite. He loves the crunchy texture of waffles but hates soggy pancakes. I tell him i use the exact same batter to make both so it makes no sense, but now I’ve met someone else who is just like him! Ha! To each his own. Can you use a reg. blender to make these? I do not have a vitamix or one like that. Will a reg. one get the oats smooth? I want to make these so bad they look so yummy!!! Sharon- Go for it! You just might have to blend it longer…or you could soak your oats in the dairy-free milk beforehand…that will definitely help too! Enjoy! Stupid question. 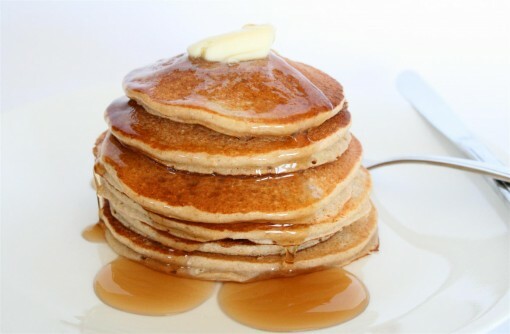 I know that these are Vegan pancakes, but would using regular milk instead of the soy/non-dairy milk affect the texture or taste? Soy milk isn’t something I often have on hand. Jessica – nope, shouldn’t affect it! Use any milk you like. Renee…just revisited this and saw your comment. My husband does gluten free and so I made these for him with part millet flour and part almond flour (I just used gluten free oats for that part) I added a little bit of cinnamon and allspice. He loves them! I’ve also made them without banana using apples and cinnamon and he loves those as well. That way you have 2 different types to choose from. Best pancakes .My husband love them. i did something amazing with them… i layered them between peanut butter and jelly.. pancake, peanut butter, pancake strawberry jelly, pancake and toped a banana puree!!!! absolutely amazing u gotta try it… i forgot to take a picture of it.. when i make it again this week ill post a picture for u all!!!!.. I made these pancakes for breakfast! They were fantastic! I love that they are healthy. My little picky toddler ate them up! Thanks for the great recipe. — do I need to cook the oats beforehand?? AND– the directions say to put everything in a blender, but when I read the comments, I see that you have said to stir lightly by hand. I’m a little confused. Nope. Don’t cook the oats…and yes, use your blender…just don’t blend it too long. Enjoy! Have you tried making these with water? With the bananas, I imagine they’re still pretty flavorful this way? Crystal~ I love the idea of cinnamon. K~ No, I haven’t…but I don’t see why it wouldn’t work…let me know how it goes! Just made these this morning, yum! I added some mini chocolate chips. For those experiencing mushy middles….I did too at first. There are a lot of bananas in this recipe! I cooked mine at a lower heat (300 instead of 350 on my griddle) and it helped immensely. They were still moist in the middle (more than a buttermilk pancake) but it was just the banana. These are just wonderful and my 3 year old LOVES them! Thanks for a great recipe. I added an egg to the batter, cut the recipe in half, (just feeding myself), and didn’t use a blender (don’t have one!!) – these are delicious!! They are quite filling, too. My whole family loved these pancakes!! They cam out a little firm, not fluffy, but once they warmed in oven while waiting for all to be done they got softer and fluffy. I added cinnamon vanilla and pecans…sooooo delicious! These are by far the best pancakes I’ve ever had! Thank you so much for the recipe. One batch does 3 quick breakfasts for me, I just keep the leftovers in the fridge. I added cinnamon to the batter, so yummy! These are the best! Thank you! Is there a way to do this without a blender? I am in a kitchen right now that is not very well stocked. I just whipped these up in our Baby Bullet blender that we use for homemade baby food for our daughter. I subbed in skim milk & used one banana because I like banana flavor, but I don’t LOVE banana flavor. Also, I added 1tbsp of milled flaxseed to bump up the health factor and they were fantastic! I’ll definitely use this recipe again and again for my family. They passed the ultimate test because my 7 month old baby loves them too! My 3 yr old absolutely loves these pancakes, he gets excited helping me mash the bananas, then watches me flip them in the pan, can’t make them fast enouhg and it takes only minutes. He says banana pancakes are his favorite, no syrup, just plain pancakes. The adults love them too. My pancakes did not cook all the way through and are mushy. Any suggestions to fix this? Chelsea – Thinout the batter with more milk and pour less into the pan. This will make the pancake thinner & cook all the way through. Also, make sure to use a good non-stick pan…it makes a world of difference! I just found your site, and I can’t wait to surprise my kiddo with these pancakes in his lunch box on Friday! I love that they are mostly made from oat flour, too. Thanks! Tried this recipe on Saturday morning and it was delicious! I cooked them with coconut oil…and it was just divine. I had a hard time saving them for other people! I will definitely be making these again, and will try some modifications to make them for some of my gluten-free friends. These were fantastic;) we made them for our cousins who came to stay. No one has dairy allergies so I didn’t have soy milk to hand, however I had buttermilk. They were so fluffy and tasted so good I got asked to make a second batch!! Came accross this recipe on my “Healthy Cooking” board on Pinterest looking for another pancake recipe I had tried previously. So many good comments; thought I’d give it a try for the evening meal. Turns out I have deleted this recipe from my board so that I do not accidently make these pancakes again. These were not great at all. It was a shameful waste of time, energy, and supplies. I could have made a bowl of oatmeal easier and in less time with much less mess in the kitchen. They tasted of nothing but oatmeal and banana! Which is ok if that is what one is looking to eat. They were dense and mushy in the middle and left an odd after taste. Followed directions exactly. Sorry, this recipe hit the trash bin. After searching for a year a decent pancakes recipe, YOUR RECIPE IS FABulously Delicious! (I think Pancakes are weekend celebratory meal! You are a Winner! This is my 4th weekend preparing the pancakes in my Vita Mix. I used the thick canned coconut milk from Whole Foods. These pancakes are a keeper for my “Favorite Recipe” file. A big hit with my family, and I did use the blender and the batter poured just perfectly! I used coconut creamer and the flavor was great! A wonderful vegan sugar free recipe which we say a big thank you for sharing! It will be a a staple in our home.Thanks so much! These were so so good! I used almond milk and added chocolate chips and they were perfect and both my little girls ate them right up! Thanks for a new recipe I will use often! I made these this morning with vanilla almond milk and topped them with peanut butter AND maple syrup- perfect! Thank you! These are so good! I added grounded flax seed, cinnamon and nutmeg, for personal preference. I also used honey and walnuts for the topping! Yum! I just made these and I thought they were great! I drizzled some organic maple syrup over and topped them with some vegan butter.. Wow! I’ve been craving pancakes for months, I gobbled them down so quickly. The small hint of banana was fantastic (I love banana pancakes). Next time I’m going to add some banana chunks to make it taste even more to my liking. Thank you much! Made these pancakes for breakfast this morning, and they were very good! I followed the recipe as written, but I also added 1/2 tsp of vanilla extract and 1/4 tsp of ground cinnamon. i just made these pancakes and they are fantastic! I used cows milk as we don’t have any other milks. They were even better with a touch of maple syrup, next time I will add a little to the blender. Thank you for an amazing, healthy recipe!! I made these this morning! Though they were a bit dense, they definitely satisfied my craving for some pancakes, especially with pure maple syrup on top. These were excellent. I used almond milk, added a sprinkle of cinnamon and a handful of blueberries at the end (pulsed a few times). When I tried making them on a cast iron griddle, it kept sticking and not cooking through so I switched to a non stick pan and problem solved. I think I may have overblended the batter as mine were still thin and a little dense but they tasted great. I’m not vegan but I try to go meat and egg-free whenever possible. This was fast, easy and healthy. Thanks! Thank you so much for this soooo good and easy recipe! I love them! Can one replace the whole wheat flour with soybean powder (kinako) instead? Tristan – I haven’t tried this, so I couldn’t tell you…but if it’s like a flour I’d say give it a go! These were pretty good but were a bit too salty for my taste. I think in future I would either omit or drastically reduce the salt. LOL mine looked nothing like that!!!! I used white flour & also cooked them on a cast-iron skillet – they stuck like CRAZY and didn’t turn out well but they are still yummy! Ali – I’m sorry yours stuck! Cast iron is tricky. I now only use non-stick pans. I have been making these since 2012, with slight variations due to what I have in the house and they are a favorite. Hints: grind up the oats first in the blender, silver dollar size is best to avoid gummy middle and add a little more of the other ingredients if the bananas are larger. YUM! Leah – So glad you loved! Thanks for passing it on! Excellent recipe, I’ve tried many vegan pancakes that have epically failed, this one turned out excellent! Any tips on using less oil? I have a cast iron pan..
Chana – I used to cook with a cast iron pan and sadly, I felt like I needed more oil for that one. Now I use a ceramic non-stick pan (which is healthier than the normal non-stick) and I hardly ever have to use oil. I love these pancakes – it’s the only recipe I use now. I’ve even started buying extra bananas to ripen so that I can make these – they’re that good. Thanks for the great recipe. Sarah – So glad you loved them! I had a major craving this afternoon for pancakes. I couldn’t believe how delicious the pancakes were! I love that the recipe is vegan and that it calls for such few but healthy ingredients. My husband loved them too! This is definitely my new go-to pancake recipe. Thanks! I didn’t have baking powder so used about 2Tbs of ground flax seed and they turned out great! We really like these. But 2 teaspoons of baking powder has 880 mg of sodium, 1/2 teaspoon sea salt has 1,180 mg. So with 4 servings, the sodium is 515 per serving. Or with 12 pancakes, it would be 171 mg of sodium per tiny pancake. I left out the added salt to help bring that level down.